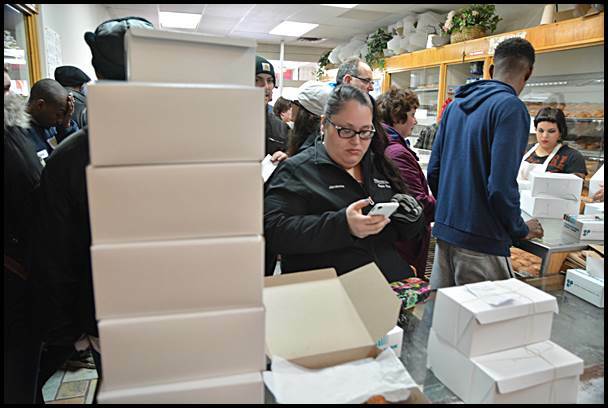 Local bakeries will be jammed with paczki lovers this coming Tuesday. The wait can sometimes stretch for over two hours. You can beat the rush on Paczki Day by picking up your dozen on Monday. Hamtramck’s very own holiday kicks off this Saturday. At 10 a.m. the annual 5K Paczki Run starts at Jos. Campau just south of Holbrook (in front of the Motor City Bar). After the run, which is sponsored by Tour de Detroit, the fun continues at the Downtown Development Authority’s Countdown to Paczki Day in heated tents set up in the Hamtramck Town Center parking lot. Inside, you’ll get free paczki and enjoy live polka music. Thousands of runners and spectators have been turning out for both events. The Mardi Gras spirit continues on Tuesday, Feb. 13 – Paczki Day. Once again, thousands of people will be walking the city streets to buy their dozens of paczki at local bakeries. The day is also a huge revenue stream for local bars, many of which host live music. A crowd favorite is watching the paczki eating contest hosted at PLAV Post 10, in the upstairs hall. That starts at noon, and lasts an agonizing 15 minutes. In the past, the winner has eaten upwards of 20 paczki. Don’t think too hard on that. Also later at Post 10, Hamtramck favorites Danny D plays at 4 p.m., and the Polish Muslims play their third and final set at 6:30 .m. The Polish Muslims kick off the day at 10:30 a.m. at the New Dodge Bar, and then move the party over to Whiskey in the Jar at 2:30 p.m.
You can start your day really early at the Moose Lodge, located at 9421 Conant. Starting at 7 a.m., they’ll be serving up egg soufflé with kielbasa and paczki. DJ “Chuck E” will be spinning tunes. Admission is super cheap at $6 with proceeds going to the Hamtramck Goodfellows. Over at Trixie’s Bar on Carpenter just south of Jos. Campau the bar will open at 4 p.m. on Tuesday, featuring “Jezy” (Polish brandy, also known as “stupid juice”) specials, food, open mic comedy and karaoke. Small’s Bar, at Caniff and Conant, also opens early at 10 a.m. and will once again offer up their “paczki bombs.” If you have not heard of this before, just take a guess, considering this is a bar and they are offering paczki. Yes, you guessed correctly, it’s a booze-infused paczki. The bar also has a fantastic line-up of bands. One of the highlights is Polka Floyd, which again if you are guessing what that is, it’s a polka band playing Pink Floyd tunes. Here’s to a safe and fun Paczki Day.